Soak the beans in cold water the previous day. Cook in salted boiling water for 1 hour. Chop the carrot, celery stick, leek and onion very fine. When the beans are soft, add the chopped vegetables into the casserole and cook for 5 minutes. Throw through a colander to strain the liquid and pour into a salad bowl. Mix the vinegar with the salt, pepper and parsley, add (.021pts ) 10 - (.031pts) 15ml olive oil and add to the beans and vegetables while it is still warm. Let it marinate for at least 2 - 3 hours and stir occasionally. (Don't put in the refrigerator). 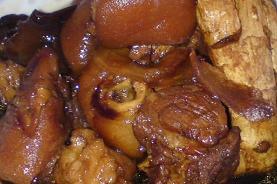 Cook the pork trotter in a cooking bag in boiling water for 20 - 30 minutes until soft. Take out of the pot and let it cool for a while. Cut open the bag and pour the juices onto the beans and mix well. Cut the trotter into slices and serve on the beans and vegetables mixture. ¼Cup Jack Daniel's® Tennessee Whiskey. 1Kg (2 lb) pork tenderloin. Heat the oven to 450°F | 230ºC. Combine all ingredients except the pork tenderloin in a small saucepan. Bring to a boil and simmer until slightly thickened, about 5 minutes. Place the tenderloin on a foil-lined baking or roasting pan. Brush with the sauce. Roast for about 30 minutes until the internal temperature is 150°F | 70ºC. Remove from the oven and let the meat rest about 10 minutes before slicing. 10 Juniper berries (or cranberries). 1kg (2lb) Lean belly pork. 226.8g (8oz) Back pork fat. 113g (4oz) Dry white wine. A handful fresh thyme (or a heaped teaspoon dried). Take a sharp knife and cut the pork into small pieces and place in a bowl. Cut the fat into small pieces as well and add to the bowl. Crush the garlic, berries and peppercorns and add with the salt, thyme and mace. Mix well, add the wine, mix again and transfer to the cooking terrine, cover and place in the oven. Cook at this low heat for four hours. After four hours, taste and season with more salt and pepper if needed. Pour the contents into a sieve over a bowl and extract all the fat into the bowl. Transfer the meat to another bowl and shred with a couple of forks. The meat should just fall to pieces now. Place the contents into either the large terrine or several small ones. Push down hard on the top and pack the meat in tightly. Leave them to go cold. When they are cold, pour the fat into a small saucepan, and heat gently to re-malt. When it has melted, pour back over the meat and place the terrine(s) in the fridge until it is time to serve them. The fat will harden on the top and seal the contents in leaving a beautiful jelly on the top. Let the pate warm up to room temperature before serving. Serve with hot French bread or toast. I like to serve a sweet fruit confit with this pate. ½ x 440g (15.5 oz) Can pineapple rings in fruit juice. 4x 100g (3.5 oz) Lean pork loin chops. 1 Teaspoon hot chilli powder. Drain the pineapple, reserving the juice. In a bowl, combine the juice with the honey, sherry, mustard, chilli powder, salt and black pepper. Put the pork chops and pineapple into a shallow dish. Pour over the marinade, reserving 2 tablespoons of the mixture. Cover and leave in the fridge for 30 minutes, turning once. Preheat the grill to medium. Remove pork chops and pineapple from the marinade. Discard the marinade. Put chops on a grill rack and brush with reserved marinade. Cook under the grill for 8 to 10 minutes on each side, or until cooked and tender. Grill pineapple for the last 5 minutes of the cooking time, turning it once. Arrange the pork chops and pineapple slices on a large serving plate and garnish with the spring onions. 1kg (2.2 lb)Pork spare-rib, cut into strips between ribs. 300ml (10 fl oz) Chicken stock. 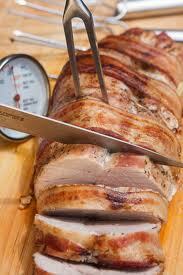 Cut pork into 5cm (2'') lengths, then into 1cm (.39'') wide strips. In a small bowl mix together cornflour and soy sauce. Stir in the stock. Heat 1 tablespoon oil in a wok or non stick frying pan, until hot but not smoking. Add pork and stir fry for 3 to 4 minutes, or until no longer pink. Remove with a slotted spoon. Set aside. Add the remaining oil and onion to wok or non stick frying pan. Stir fry for 2 minutes. Add broccoli, pepper, garlic and ginger. Stir fry for 2 to 3 minutes, until tender crisp. Return pork to wok or pan. Add cornflour mixture and bring to the boil, stirring, until thickened. Simmer for 2 to 3 minutes, until pork is heated through. Stir in the nuts and serve immediately. 5ml (.17 fl oz) Salt. 15ml (.50 fl oz) Freshly chopped oregano. 5ml (.17 fl oz) Fresh thyme or 2ml (.07 fl oz)dried thyme. 7,5ml .25 fl oz) Aniseed. 1,5kg (3.3 lb) Pork fillet. 15ml (.50 fl oz) Cake flour. 2 Onions, cut into rings. 750ml (25.3fl oz) White wine. 625ml (21fl oz) Chicken stock. 1ml (.03fl oz) Ground nutmeg. 125ml (4.2 fl oz) Cream. Rub the oil, salt, pepper, oregano, thyme and aniseed evenly over the meat. Sprinkle the flour over the meat, place the onions on top and place the meat in an ovendish in the fridge. Pre-heat the oven to 200ºC | 392ºF . Place the wine, chicken stock, garlic and nutmeg in a pot. Bring to a boil for 5 minutes. Place the pork in the oven and roast for 15 minutes. Add the liquid and lower the oven temparature to 160ºC | 320ºF . Cover the dish with tinfoil (shiny side facing down), and ovenroast for another hour. Remove the foil and roast for a further hour. Place the meat in a serving dish. Melt the butter in a pan, add the flour and remaining juices while stirring. Add the cream and salt and pepper to taste. Cut the meat into slices and serve with the sauce.